Last edited by yoitisi; January 13th, 2008 at 11:19 AM. 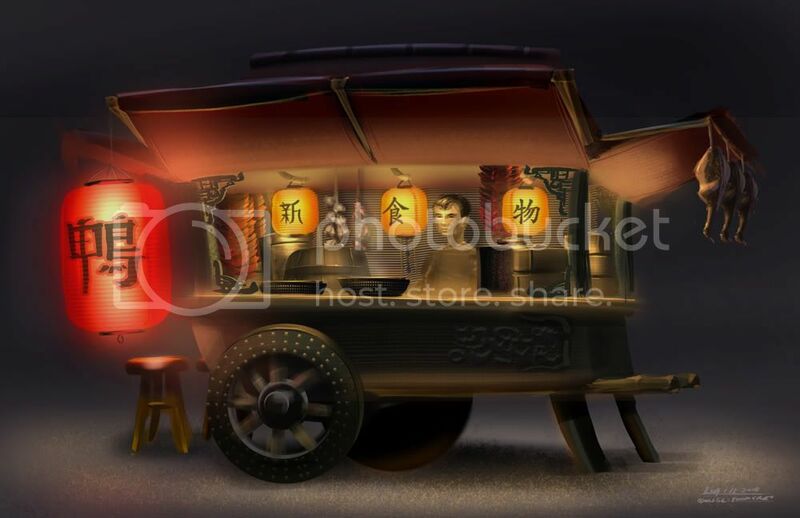 The large buoyant forms of the travelling vendor vehicles are a common sight on the bustling streets of the Kyo-Tokyo-Conurbation. Different companies are easily distinguished by their dominant character-masks, reminiscent of the carried Omatsuri floats of old. Little kitchens nestle at the hearts of the vehicles, a long service bar along the base with rows of seating so that customers maybe carried along as their orders are prepared above. With the insides of the craft taken up by floatation devices it is common for supplies to be carried bundled onto the outsides of the vehicle. 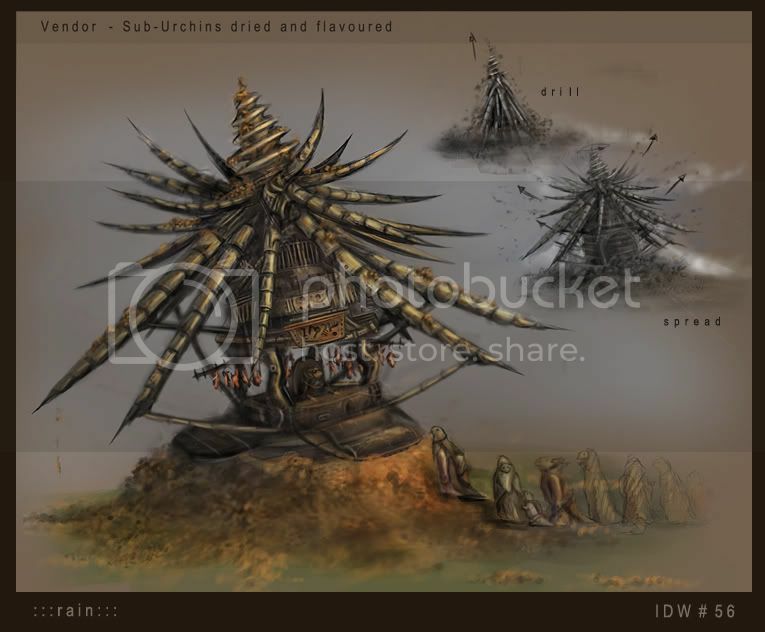 "Always traveling, his home is with his customers"
Dried and Flavored Sub-Urchin meat is considered a irrisistably tasty snack among the Kahibies, but because Sub-Urchins live hundreds of meters below ground only specialised vendors can harvest them and process the meat. Sub-Urchin Vendors drive giant self contained drilling machines that tunnel below ground, harvesting Urchins and traveling from town to town. Often the low rumble that signals a vendor approaching sparks much excitment among the locals. I honestly expected more entries with this topic, but apparently not everyone was inspired (and not everyone finished theirs, including me so I should shut up right now I guess ). Also, not all that was posted in the original thread made it to poll because of this, they were still WIPs. D-Holme: I like the idea very much, but I think it's a pity you didn't put any color in it. The sketch itself could've used some more love as well. I took it to poll because of the idea, but the execution made me doubt my decision for a bit. Legato: Yours was the opposite, I liked the execution of the idea, but it was barely within the topic I think. Still, I've let that decision to the voters. consider it was right after the holidays, maybe some left over exhaustion. personally, for every week, if I dont have almost an immediate idea, I am not going to have enough time to make even a reasonable attempt. due to that, although I am here often, I dont participate a lot. Just where I am at. D-Holme: I like the concept and sketch, but it is, just a sketch. I would have considered it more, should it have been more finished. Orion: solid idea, decently presented. Nothing bad about it, but nothing that pops out either. rain: got my vote. I think it was a novel idea. The color palette helped the presentation. As a concept would go, to me this would be fine. Legato: another nice piece of work where you did what I thought even a better coloring job. Its a personal issue, i didnt like subject. Nothing taken away from your work and idea. Nice clean solid concept though. PutridusCor: Decent concept. Although its self explanatory, and the original thread didnt mention a write up, most of them usually do and it would have added. the presentation was decent to, a good effort, I just thought rains was a bit better. D-Holme I liked your design, but as dragonspit said it was barely finished so....would have interesting to see the colour palette you would have used. Orion9282 Nice and solid. The back wheel really bugs me though. Great use of lighting!! Legato The idea about Meth....not sure if thats considered food, food the concept is solid and besides the font you used for the lettering, I liked this design! -where is the guy's legs? -a little more muddied that i would have liked, it would be nice for a slightly larger picture as well! but my vote goes to you! Last edited by paran0id; March 8th, 2008 at 01:57 PM. Last edited by nutkin; January 20th, 2008 at 06:13 AM. Legato, Rain, Dragonspit: thanks for the crits... I realize everything that you guys are saying. Once rain put his/her entry up, it dawned on me that I didn't push the concept far enough. Also, nice job rain, you got my vote. Legato, I dont think you owed an apology or anything like that. I believe you should always do what you think of, and its always good to think off the beatin pathish. my 2 cents. Thanks for the comments. The more I see my own concept, specially the presentation.. more I hate it, yeah, maybe I would have had to try something more fantastic and less "futuristic"... well..
Orion9282 – I like the history to the image and the idea if the travelling market stall but have to agree with what over have said that there is nothing ‘new’ happing with it. I don’t think that every design needs to be totally original and old ideas can be revisited but it should be important to add something that makes the design yours. The perspective around the wheels looks a little off and the far wheel looks too far forward when compared to the angle of the front of the cart. Technically, people have already mentioned the possible lack of space for his legs (although a possible if kneeling I guess) and the shafts at the front look a little short to be comfortable. Other than that I like the soft lighting and details of the foods and cooking. Rain – I like the originality of the idea and the strangeness is interesting, suggesting plenty of uncovered background. The rendition is quite small and some of the detail is lost in it – perhaps the image would look stronger too if the shadows were a little harder to give some depth to the vehicle (particularly the drill mechanism). Legato – I wouldn’t think the concept is offensive but is perhaps off topic. The rendition is nice and the simple figures work well for me. The bold colours come cross nicely and the vehicle looks like it’s been around for a while from the wear and tear. 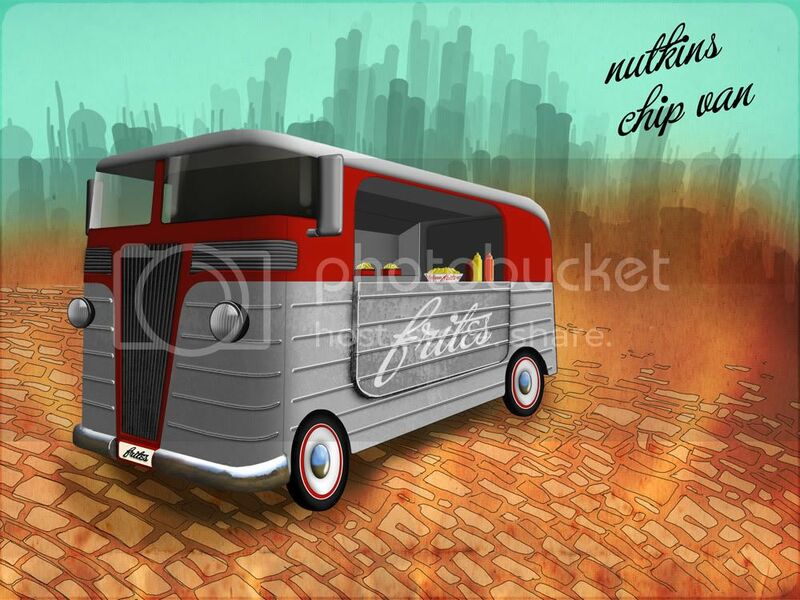 Not sure how well the technical element of the van comes across how it actually moves – it seems to have retraceable legs and empty wheel arches – I wonder whether it is suppose to have been on older wheeled vehicle converted to a walking or hovering craft? PutridusCor – I like the original idea but think the design could be brought together better into a stronger concept. The vehicle looks very big for what it is and from this angle there is nothing showing to justify the size (eg. more chefs, ovens, etc). The rendition could be stronger perhaps with some more defined lightening and metal finish. Some of the angles/perspective on the details could benefit from some more time spent on them – like the fans and the roof panels. Hope these comments some kind of sense, I was rather haphazard in my writing of them. My own piece - tried to be original with this one, I’d have liked to managed to put some colour on it but in the end I chose to concentrate on form and perspective and try not to rush everything in the time I had – especially after I felt my last entry (the MBT) was a rather rushed orthographic with quick colours. I’d hoped to do a tidy pencil image of it but it came out as rather sketchy and messy – I think the scanning might have flattened some of the tones out but that shouldn’t be an excuse. Thank you to everyone for their votes and comments.